Have you been left out? We have a new face in our commercial team - Mohammed Ahsan who has spent the last three years working in our Personal Injury Department. Now, he’s been promoted to a new role to handle a wide variety of dispute resolution issues. 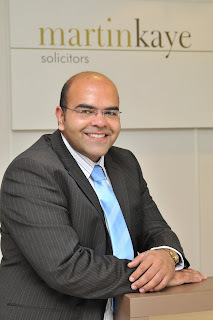 Mohammed completed his law degree at Wolverhampton University, and joined Martin-Kaye Solicitors in 2002, initially as a legal assistant. He was instrumental in helping to set up the firm’s Housing Disrepair team, and once his training was completed, he qualified as a solicitor in 2005. 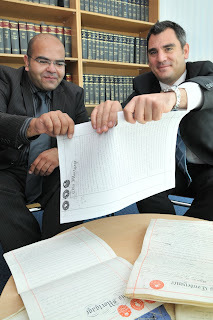 In his new role, Mohammed will deal with all kinds of disputes including: computer and IT issues; construction and building disputes; contracts; copyright and design; and debt collection, distribution and agency disputes. Can company bosses prevent a member of staff from taking “confidential” information with them when they resign? Not necessarily, says John Mehtam, our Employment Law Specialist. “Information which you may regard as being classified, is often in the public domain, and if that turns out to be the case, there may be nothing you can do to stop former members of staff taking the information with them. “As a general rule, in order for something to be confidential and owned exclusively by the company, it either has to be a trade secret, or something that you’ve been given in confidence which isn’t public knowledge. John said there were a number of steps which companies could take to protect themselves. Shropshire companies planning out-of-office fundraising events are being urged to make sure they don’t fall foul of the law. “Even though it’s a non-business activity carried out in non-business time, both employment and health and safety legislation will apply,” said Graham Davies, our Senior Partner. Graham urged Shropshire companies to weigh up the risks of any planned activities, such as sponsored walks, bike rides or other activity-based fundraisers, against the potential benefits. Companies should also ensure that their insurance policies covered non-work activities, or take out additional cover for specific events. “Something else the company must do in order to avoid potential problems is to check out any equipment staff may plan to use, to ensure it complies with the Health and Safety at Work Act. We've launched our very own award to recognise staff commitment and dedication. The Employee of the Quarter Award has been introduced as a “thank you” to employees who go the extra mile. And the first winner is Chris Mills, our Assistant Systems Manager who joined the company in 2005. 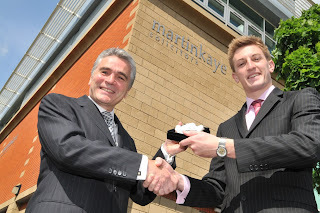 Managing Partner, Andrew Green, said: “We felt it was important to recognise staff who really stand out, and Chris is a prime example of the very best kind of employee that we have here at Martin-Kaye." To mark his award, Chris received £100 worth of Debenhams vouchers, an extra day’s holiday, and an engraved paperweight. Arguments over the will after the death of a loved one are on the increase, and we are tackling the issue by launching a new website designed to help people who feel they have missed out. We've launched www.contest-a-will.com and have already been inundated with enquiries from all over the UK. Chris said after an increased level of enquiries about the possibility of contesting wills, the team decided to research the market further. There are strict time limits for claims to be dealt with, so anyone who feels they have not received their fair share of an estate must seek professional advice at the very earliest opportunity. Parking fines issued by private landowners in Shropshire may not be worth the paper they are written on, a county solicitor has warned. Graham Davies, our Senior Partner, said strict new regulations made it almost impossible to force drivers to pay. Graham said: “Even if signage on the land appears to prove your guilt, the landowner will have big problems taking things any further if they can’t gain access to your personal details." And he said it was difficult for a private landowner to meet the standards required, since they had to maintain sufficient liability insurance, and follow strict ticketing guidelines. Debt collection agencies have fresh powers to take action against directors for their company’s unpaid bills. That's the warning from Chris Detheridge, from our Commercial Team, who said it was no longer safe to assume that a director was immune from being personally liable. He highlighted a Court of Appeal case last year which found that directors can be held personally responsible for a debt, if it can be proved they entered into a contract knowing the company could not pay its way. “This case makes it clear that it’s very dangerous for you to sign something, whether it's a lease or a contract, when you either don’t believe that the company can honour its obligations or you don’t actually know. He said debt collection agencies were on particularly strong ground if the company’s paperwork was lacking. “You must ensure that the company’s full details appear on all letters, cheques, order forms, website and in any electronic communication. Chris said debt collection agencies now had the law on their side in an increasing number of instances. Directors could find themselves personally liable if there’s an issue over their company’s rented premises. Sarah Heath, our Commercial Property Specialist, said directors must be aware that just because they rented their business premises, they were not safe from any problems that may arise. “You may have assumed that as you rent the premises, if there are any issues that come up with the landlord, then they’d be the company’s problem. But even though the lease will probably be in the company’s name, as a director you cannot sit back and assume you have no responsibilities. Sarah said if, as a director, you had given a personal guarantee, the best approach was to try to resolve any issues through negotiation with your landlord. “The chances are that you will probably have a full repairing lease – this means the company has to ensure the whole of the premises are maintained and repaired, not the landlord. And if anyone has an accident as a result of the state and condition of the premises, they could look to the company for compensation. Sarah said companies should ensure at least one member of the board was responsible for health and safety issues. They should also look after the company’s obligations in terms of the repair and maintenance of the property. Company directors are well aware of their responsibilities when it comes to health and safety issues in the workplace - but may be ignoring the risks they face themselves. Our Employment Law Specialist, John Mehtam, said: “Directors of small and medium-sized companies all over the UK are subjecting themselves to health risks from the stressful situations they face every day. “With the constant stream of changing legislation, and the increasing pressures from the troubled economy, it’s no wonder that directors are finding things difficult. In fact, research has shown that 40 per cent of owner/managers and directors of SMEs are working over the EU maximum limit of 48 hours a week." John said the Working Time Directive limited the amount of hours people should work during a typical week, with staff required to sign an opt-out form if they were likely to exceed the 48-hour limit. John said owner/managers and directors should take a step back, and start to consider their own working conditions. Your company could be breaking the law when it comes to selling over the Internet. Graham Davies, from our Commercial Team, said research had shown that up to two thirds of companies selling online could be breaching the rules. The websites were checked in relation to the Consumer Protection (Distance Selling) Regulations 2000 and the Electronic Commerce (EC Directive) Regulations 2002. Graham said it was vital for companies to include details of their cancellation and refunds procedure on their website. “Include this information in a terms and conditions section, and to protect your company still further, make sure customers can’t proceed to the checkout until they’ve accepted these terms. Graham said many companies also failed to include a full physical contact address on their website, as well as an email address (not just a web form) so customers could contact the supplier. “The Companies Act 2006 says not only must you include your full physical address, but also your company number and where the company is registered on all your literature, which includes your website.